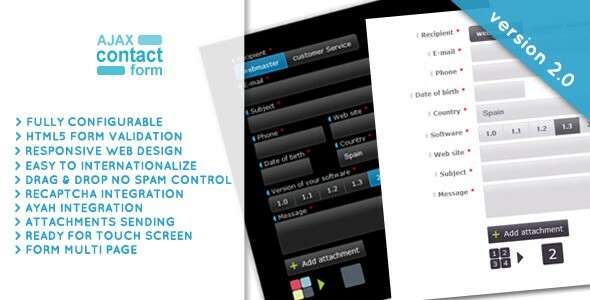 Ajax Contact Form with attachments 2.0 - CODELISTPRO | Free Premium Scripts, Plugins, Apps Source Code. Ajax Contact Form with Attachments and no spam control (drag and drop, reCaptcha, ayah) The w2 Ajax Contact Form is a complete solution to create ajax contact form. Designed to be a flexible plugin, this item offer classics and originals features. You can easily create your own forms HTML templates and your own themes CSS.